← Today is Going to Be a Good, Good Day! Evora’s Earth, 85 x 96 inches, by O.V. Brantley, 2001. Right about now the cooks of the world are in a full sprint to the Thanksgiving finish line. The earth has given up its bounty, and the cooks are working their magic. I am not a cook. India and I rely on the kindness of strangers (actually my sweet neighbor Connie) for our Thanksgiving dinner, but I appreciate those who are. Since it is still a couple of days before we eat, let’s give thanks to Mother Earth for the food we know is in the process of being prepared. 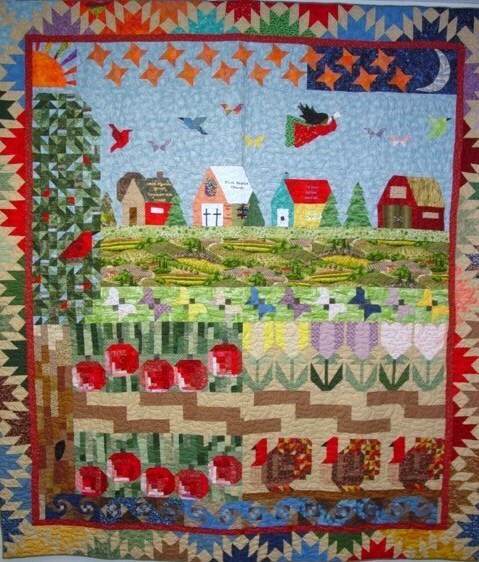 Evora’s Earth, the quilt that hangs in my dining room, honors my mother. She was a great cook. This entry was posted in A Quilter's Life, My Musings about Life and tagged African American quilter, Evora's Earth, India Brantley, O.V. Brantley. Bookmark the permalink.